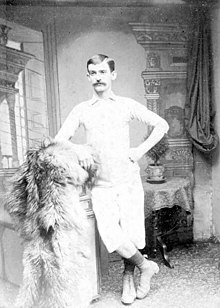 Fergus "Fergie" Suter (21 November 1857 – 31 July 1916) was a former stonemason and footballer in the early days of the game in the United Kingdom during the 19th century. Arguably the first recognised professional footballer, Suter was a native of Glasgow, Scotland, and played for Partick before moving to England to play for Darwen and Blackburn Rovers. His first moves below the border into English football were with Partick, and on 1 January 1878 he played for them against Darwen at Barley Bank, and against Blackburn Rovers at Alexandra Meadows the following day. Towards the end of that year he began to play for the Lancashire club Darwen, following shortly after the arrival of fellow Partick player James Love. Although the game was officially amateur at the time, Suter's move to England to play for Darwen in 1878 was shortly followed by him giving up his job as a stonemason, allegedly claiming that English stone was too difficult to work, and fuelling criticism that he was being paid to play. During the summer of 1880 he caused still more controversy by moving to Blackburn Rovers, a local rival of Darwen. The move again stirred up accusations of professionalism amid claims that Blackburn had offered him improved terms. Suter's move inflamed an already testy local rivalry, and bitter games and crowd trouble dogged future Darwen/Blackburn matches for years. His career was all but over by the time the Football League formed in 1888. He made only one appearance for Blackburn Rovers in that competition, on 22 December 1888 against West Bromwich Albion as a replacement for the goalkeeper Herbie Arthur. He appeared in four FA Cup finals, and after Blackburn were runners-up to Old Etonians in 1882, he collected three winner's medals in 1884, 1885 and 1886. In later life he ran the Millstone Hotel in Darwen, and died in Blackpool in 1916. ^ "History of Football - The Global Growth". FIFA Official Website. Retrieved 20 April 2014. Jackman, Mike (1995). Blackburn Rovers: An illustrated history. Breedon Books. ISBN 1-85983-022-6. Twydell, Dave (1989). Rejected FC, Volume 2. Dave Twydell. ISBN 0-9513321-2-0. "For sale: Glory of Fighting Fergie". Lancashire Evening Telegraph. Retrieved 5 February 2011. "From Partick with Love - the story of Jimmy Love and Fergie Suter, the first professional footballers". Retrieved 20 April 2018.